Huckleberry oatmeal, huckleberry milkshake, huckleberry BBQ chicken – the menu highlights all things Huckleberry at the Huckleberry (What else?) Patch Restaurant in the St. Regis Travel Center. A family tradition has been established; we have to stop at exit 33 when traveling on I90 between Missoula, Montana and Spokane, Washington. At the very least we need a huckleberry lemonade to go. Our recent visit was well timed for a lunch break starting with a tall glass of the special lemonade. The chilly, rainy day called for hot soup, a rich beef, mushroom, barley. We chose to split a buffalo cheeseburger in an effort to save room for dessert – a crock bubbling over with warm huckleberry rhubarb crisp topped with scoops of vanilla ice cream. YUM! Not a bite was left. The menu tells us, “Sweet, tart wild huckleberries grow only in moist mountain areas and cannot be commercially grown. Wild berries are not sprayed with chemicals or fertilizers.” Regional residents tell me natives are very secretive about huckleberry patch locations; they tend to be as territorial as the local bears. Residents, visitors and bears consider the berries a delicacy. At the Huckleberry Patch, breakfast choices (served all day) include huckleberry flapjacks and huckleberry cream cheese french toast topped with huckleberry syrup, of course. Opt for a huckleberry muffin or bowl of huckleberry oatmeal accompanied by hot huckleberry tea or a huckleberry latte. At lunch one can enjoy a crisp garden salad with huckleberry vinaigrette dressing and a huckleberry BBQ burger. 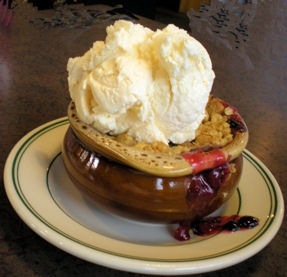 Dessert selections include pie, ice cream, sundaes, cheesecake, rhubarb and apple crisp – all with huckleberries. 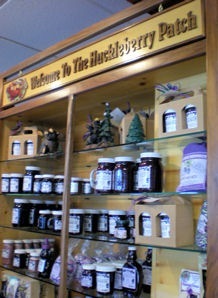 If you need something huckleberry for the road Dolly V’s in the gift shop makes homemade huckleberry fudge. One can also purchase huckleberry oatmeal, muffin, cookie and flapjack mixes. Huckleberry candies come in the form of Jelly Bellies, cordials, twists and taffy. For liquid refreshment take along a case of Jackson Hole High Mountain Huckleberry soda. Looking for gift items? There’s huckleberry lotion, lip balm, bath tea and body spray, probably guaranteed to attract members of the bear family. The extensive gift shop offers a wide selection, especially of Montana souvenirs. 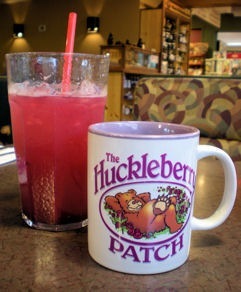 How about a Huckleberry Patch mug? The travel center also houses a convenience store, gas station and Montana-style casino. Make a stop in St. Regis for a huckleberry good time. Wondering if this is related to an everything huckleberry store and restaurant in Hungry Horse, Mt. on the western edge of Glacier Park. I thought it was also named The Huckleberry Patch. I’m not aware of a connection but there certainly could be. I haven’t been to the store/restaurant in Hungry Horse. The next time we stop at either I’ll ask about association – and, enjoy a something huckleberry. We were at the Huckelberry Patch Restaurant last week and enjoyed a wonderful meal. The gift shop is amazing and has a large selection og Montana collectables. When we were having lunch we were reading a book that was provided at the table with recipes and old remedies and also some old west information. We forgot to purchase the book upon leaving and are wondering if there is a way to pay and have one shipped to us. Hi I am looking for the one bear mug that I got in Montana. I think it was bought in St. Regis. And this special bear mug was unique, I bought several a few years ago but now Im down to one to drink out of and one has no handle that I use for pens and pencils. lol Anywho, Im looking to get more of these mugs, they have bears camping, one bear is sitting by campfire roasting marshmallows and there is another bear in tent sleeping with feet sticking out of tent. It looks hand painted, there are trees all over with huckleberries draped around mug at bottom. there is a quarter moon in sky, you see snow capped mountains. the colors are bright. Purple at top of mug, blue at bottom of mug. It says Montana on inside up by the rim of cup. it has trees and mountains, its an outdoor camping scene and I love it! I paid 16.95 for each cup and I love them dearly!!! I just cant find them again! I think if Im not mistaken I bought it through St. Regis giftshop something. I know there are lots of them there but this mug is special, wish I could put a picture here. can anyone help me? thank you muchly! In Arizona. We always stop there on our way from Tacoma to Big Mountain every Christmas time, seven years in a row now. The kids & I love that you can get anything and everything there. It’s a fun tradition.